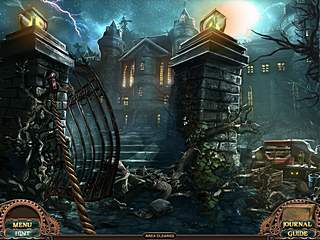 If you are one of those who are well familiar with all the games released into the hidden object puzzle adventure genre, you most probably would expect one of the Gogii games to not be disappointing. But maybe you should just try the free version of White Haven Mysteries first. You have to love the hidden object levels in order to play the game since it has way too many of them for you to solve. The games of this genre tend to tell you some mysterious creepy stories. White Haven Mysteries has the perfect plot of that kind. Think about it. You wake up in an unfamiliar place having no idea who you are. Isn't that the most mystrious story that there can be? You have a companion with you. It's a little girl who you take to a hospital. A little girl isn't too bad considering your situation. Later you learn that you were drugged by somebody and your life is now in your hands as you try to find the antidote and not die after the drug that had been given to you. The game is full of unexpected turns, the biggest of which is the end of the game when it doesn't really explains much. You have to love the hidden object levels in order to play the game since it has way too many of them for you to solve. Some may consider them too easy though. But if you are a fan of that part, you will have a lot of them to enjoy here. There is an interactive part too, but it is not as big part of the game as in some games. And of course a few puzzles are thrown into for you. There is a Strategy guide if you need it at any stage. The good thing about it is that you don't have to read all through it to find what you need, but get the help that you need right away. This is White Haven Mysteries in a nutshell. If you find that attractive, then the warning in the beginning wasn't for you! 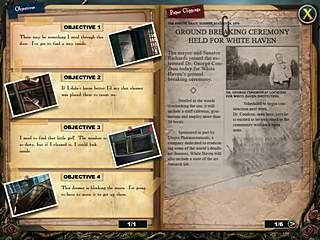 This is White Haven Mysteries review. Download this game here.